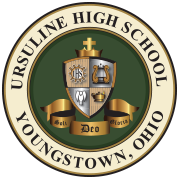 The Ursuline High School Theatre Department presented Joseph and the Amazing Technicolor Dreamcoat in the Deibel Morley Arts Center on the Ursuline campus. Performances were held on Friday, December 14th and Saturday, December 15th at 7:00 P.M. A matinee was held on Sunday, December 16th at 2:00 P.M.
Joseph and the Amazing Technicolor Dreamcoat is a musical with lyrics by Tim Rice and music by Andrew Lloyd Webber. The story is based on the “coat of many colors” story of Joseph from the Bible’s Book of Genesis. This the 50th Anniversary of this musical. It was first staged in London on March 1, 1968. Check out our Photo Gallery for pictures of the play.